Almost a year ago, I wrote a post about the Science Cheerleaders. It was one of the first of many posts around the science blogosphere about the team, and one of my more widely read posts, I think. Little did I know that less than a year later, I would be sharing the stage with them. 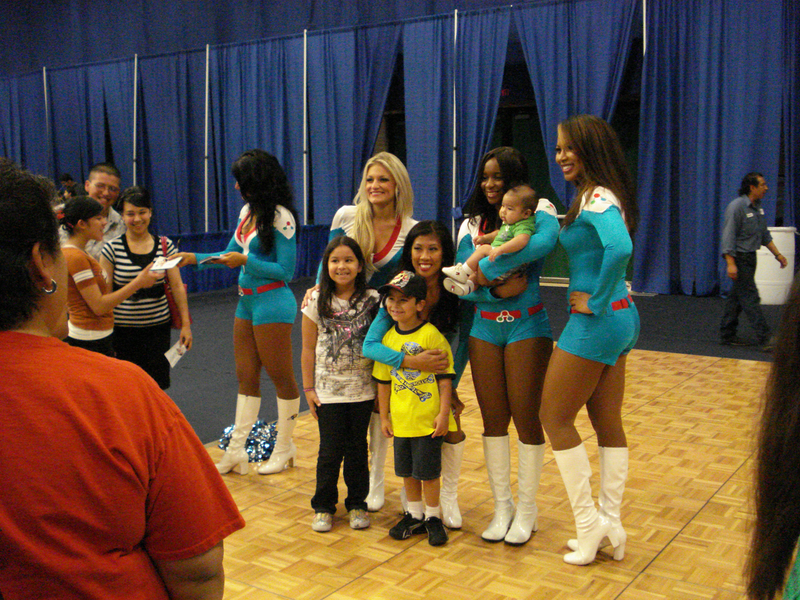 I was so pleased to work with the Science Cheerleaders at HESTEC Community Day. The weather was cooler than normal - rain for the first time in a long time! - but there were still consistently good crowds to see the Science Cheerleaders’ show. I was able to surprise them when they learned that even though none of them had been to UTPA before, they had a connection with us. The cameraman on their popular YouTube video, Brandon Garcia, was a UTPA alumnus. The Cheerleaders got asked to be part of a lot of photographs, and signed almost as many autographs. This tiara’d women is Laura Eilers, the choreographer. Ringleader Darlene Cavalier takes a picture. Thanks so much to Darlene, Laura, Melissa, Heidi, Sammi Jo, Sandra, Ada (making her Science Cheerleading debut, if I remember right) for letting me be part of the act. Hooray for the Science Cheerleaders! Additional: The view from the cheering side.